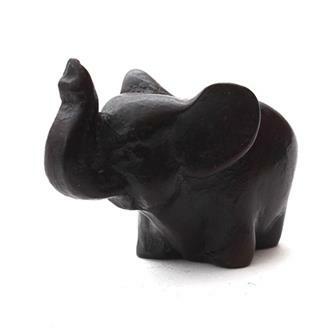 Here you will find our fabulous collection of ornaments, figurines and pieces made from lush deep dark resin. As well as our beautiful Thai castings we also now stock a small selection of painted Nepalese figures. 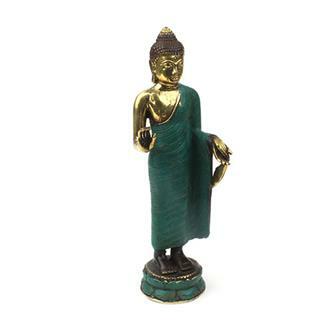 Lovely cast bronze statue depicting Buddha in the 'calling the earth to witness' mudra. Accentuated with a verdigris paint effect. 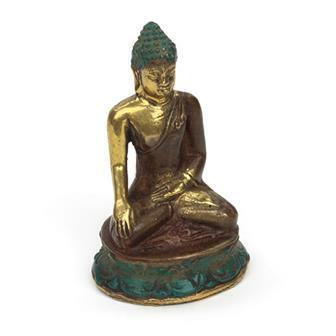 This wonderful little metal statue would make an ideal addition to any space and serve as a gentle reminder of the teachings of Buddha. 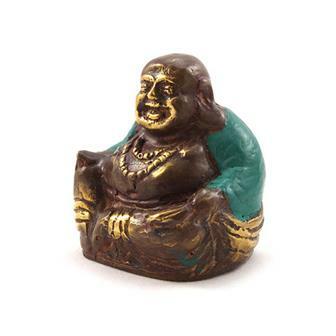 This bronze figurine depicts Budai, sometimes called 'The Laughing Buddha.' Not to be confused with Gautama Buddha, Budai is celebrated in Chinese folklore and is commonly thought to bring good luck and prosperity. 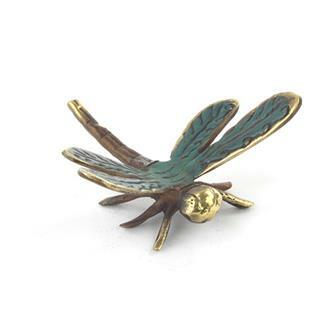 These delightful dragonflies are the perfect gift for any nature lover and are great as a desk companion. Each one is cast in a bronze metal in Bali, Indonesia. 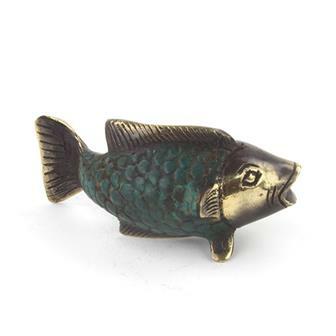 These fantastic little fish are the perfect gift for any nature lover or fishing fan and are great as a desk companion. Each one is cast in a bronze metal in Bali, Indonesia. 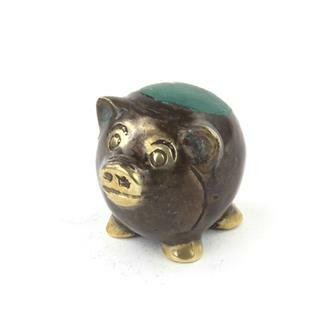 These rotund little piggies are the perfect gift for any animal lover and they make brilliant desk companions. Each one is cast in a bronze metal in Bali, Indonesia. 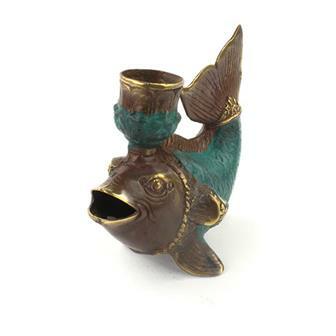 This fantastic fish candle holder has been cast from a bronze metal in Bali, Indonesia. Each cast has decorative detailing and a two tone colour effect. 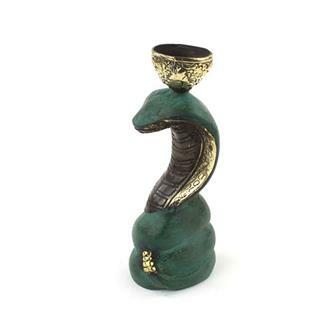 This amazing cobra candle holder has been cast from bronze in Bali, Indonesia. Each cast has decorative detailing and a two tone colour effect. To make our beautiful resin figures, a beautiful wax original is hand carved and then made into a mould. Into this the craftsmen are then able to pour the resin and create these wonderful, deep black figures. 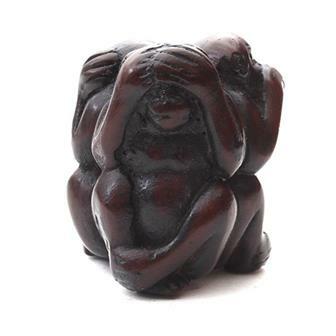 This casting depicts a version of the three wise monkeys in a circular 'See no evil, Hear no evil, Speak no evil' formation. To make our beautiful resin figures, a beautiful wax original is hand carved and then made into a mould. Into this the craftsmen are then able to pour the resin and create these wonderful, deep black figures. 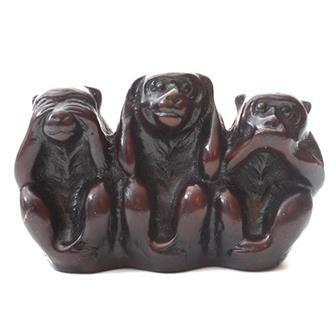 This casting depicts a version of the three wise monkeys in their typical 'See no evil, Hear no evil, Speak no evil' positions. A wonderful pocket charm. To make our beautiful Thai resin figures, a beautiful wax original is hand carved and then made into a mould. Into this the craftsmen are then able to pour the resin and create these wonderful, deep black figures. 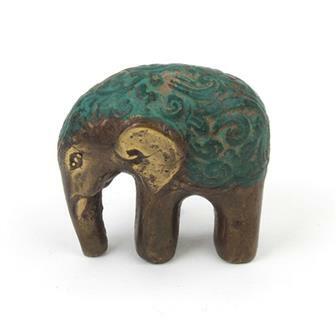 This little casting is in the shape of an elephant which are very important symbols in Thailand. 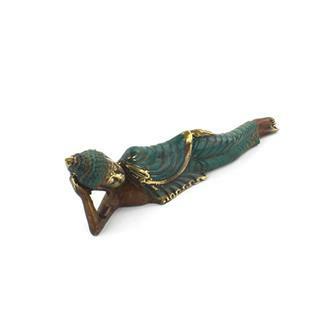 They symbolise good luck and prosperity and this little figure is perfect as a pocket charm. To make our beautiful Thai resin figures, a beautiful wax original is hand carved and then made into a mould. Into this the craftsmen are then able to pour the resin and create these wonderful, deep black figures. 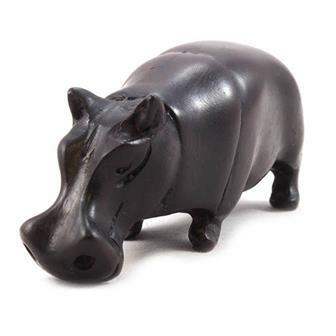 This wonderful casting is in the shape of a Hippopotamus. To make our beautiful Thai resin figures, a beautiful wax original is hand carved and then made into a mould. Into this the craftsmen are then able to pour the resin and create these wonderful, deep black figures. 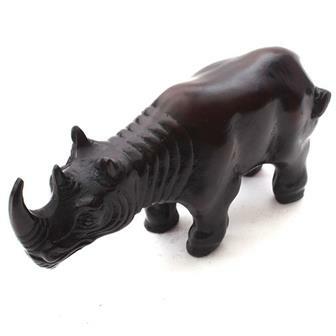 This magnificent casting is in the shape of a Rhino. 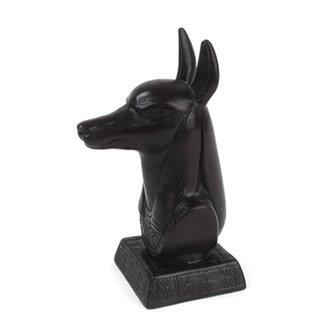 Beautiful resin statue of the Egyptian jackal headed god Anubis. He is associated with death and he presides over the process of mummification and guides the dead to the afterlife (a psychopomp.) To make these beautiful resin figures, a wax original is carefully hand carved and then made into a mould. Into this the craftsmen are then able to pour the resin and create these wonderful, deep black figures. 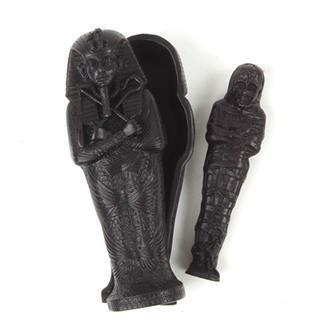 Highly detailed and interesting piece, this chunky resin cast of an Egyptian sarcophagus comes complete with its own resin mummy inside. 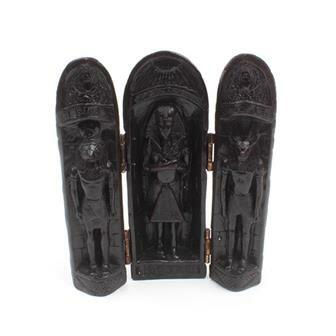 Solid resin piece with lots of detail, this decorative cylindrical box is hinged and opens out to reveal and casting of a pharaoh with Anubis and Horus on each side. 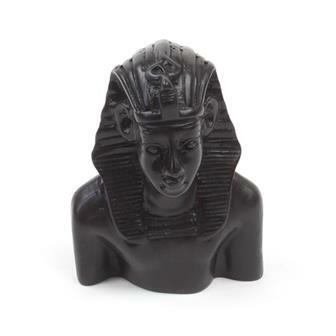 Solid resin bust of an Egyptian pharaoh. To make these beautiful resin figures, a wax original is carefully hand carved and then made into a mould. Into this the craftsmen are then able to pour the resin and create these wonderful, deep black figures. 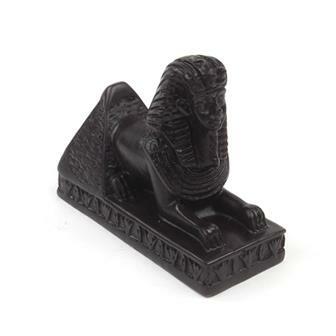 These deep black resin casts depict a majestic sphinx and a pyramid. To make these beautiful resin figures, a wax original is carefully hand carved and then made into a mould. Into this the craftsmen are then able to pour the resin and create these wonderful, deep black figures.